Santa Claus, commonly associated with Christmas, is a historical, legendary person who is mostly shown as a big and cheerful white-bearded man wearing a red suit with white trim. He resides at the North Pole with his wife Mrs. Claus, elves who build his toys, and reindeer who pull his sleigh through the sky. Father Christmas, the Nordic version, is said to reside in Lapland, Finland. Santa is best known for bringing gifts to small, good children (and children-at-heart) worldwide on Christmas (usually) by sliding down fireplace chimneys (or opening doors with a special key) and reindeer pulling his sleigh. Santa was most likely created from different traditions from European and Christian culture, such as St. Nicholas, the Dutch Sinterklaas, and others. There are many popular culture items about Santa. He is known as Saint Nicholas, Saint Nick, Kris Kringle, Kristingle, Christingle, Father Christmas, Santy, and many other names. In the Nordic version, Santa is said to live in a small hill called Korvatunturi in Lapland, Finland. There is a theme park in Rovaniemi, which is near Korvatunturi, called Santa Claus Village. The saint who inspired the legend of Sinterklaas (and thus, Santa Claus) is Saint Nicholas, who lived in the 4th Century AD and had a reputation for secret gift-giving, especially to the poor and needy, such as putting coins in the shoes of those who left them out for him. He resides at the top of the world at the North Pole with his wife Mrs. Claus, elves, and reindeer. Over the years, there have been a number of websites created by various organizations that have purported to track Santa. Some, such as NORAD Tracks Santa, the Airservices Australia Tracks Santa Project, the Santa Update Project, and the MSNBC and Bing Maps Platform Tracks Santa Project have endured. Others, such as the Dallas/Fort Worth International Airport's Tracks Santa Project, the Santa Retro Radar – Lehigh Valley Project, and the NASA Tracks Santa Project, have fallen out of use. 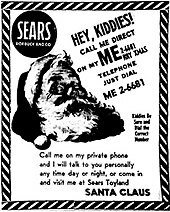 The origins of the NORAD Tracks Santa program began in the United States in 1955, when a Sears Roebuck store in Colorado Springs, Colorado gave children a number to call a "Santa hotline." The number was mistyped, resulting in children calling the Continental Air Defense Command (CONAD) on Christmas Eve instead. Colonel Harry Shoup, the Director of Operations, received the first call for Santa and responded by telling children there were signs on the radar that Santa was indeed heading south from the North Pole. A tradition began which continued under the name NORAD Tracks Santa when in 1958, the United States and Canada jointly created the North American Air Defense Command (NORAD). This tracking can now be done through the Internet and NORAD's website. 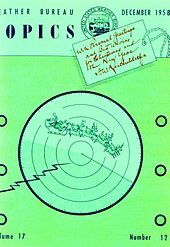 In the past, many local television stations in the United States and Canada likewise claimed they tracked Santa in their own metropolitan areas through the stations' meteorologists. In December 2000, the Weather Channel built upon these local efforts to provide a national Christmas Eve Santa tracking effort called SantaWatch in cooperation with NASA, the International Space Station, and Silicon Valley-based new multimedia firm Dreamtime Holdings. In the 21st century, most local television stations in the United States and Canada rely upon outside established "Santa tracking" efforts, such as NORAD Tracks Santa. Many other websites became available year-round, devoted to Santa and purport to keep tabs on his activities in his workshop. Many of these websites also include email addresses which allow children to send email to Santa. Most of these websites use volunteer living people as "elves" to answer email sent to Santa. However, some websites, such as Santa's page on Microsoft's Windows Live Spaces, have used or still use "bots" to compose and send email replies, with occasional unfortunate results. One particular website called emailSanta.com was created when a 1997 Canada Post strike prevented a man named Alan Kerr (credited as the "Head Elf")'s young niece and nephews from sending their letters to Santa; in a few weeks, over 1,000 emails to Santa were received and had received 1,000 emails a day one year later. Now celebrating close to two decades on-line, emailSanta.com receives roughly 1 million emails a year. Santa's main distribution center is a sight to behold. At 4,000,000 square feet (370,000 m2), it's one of the world's largest facilities. A real-time warehouse management system (WMS) is, of course, required to run such a complex. The facility makes extensive use of task interleaving, literally combining dozens of DC activities (putaway, replenishing, order picking, sleigh loading, cycle counting) in a dynamic queue... the DC elves have been on engineered standards and incentives for three years, leading to a 12% gain in productivity... the WMS and transportation system are fully integrated, allowing (the elves) to make optimal decisions that balance transportation and order picking and other DC costs. Unbeknownst to many, Santa actually has to use many sleighs and fake Santa drivers to get the job done Christmas Eve and the transportation management system (TMS) optimally builds thousands of consolidated sacks that maximize cube utilization and minimize total air miles. In the cartoon base, Santa has been voiced by several people, including Ed Asner, Stan Francis, Mickey Rooney, John Goodman, and Keith Wickham. Many television commercials, comic strips and other media depict this as a sort of humorous business, with Santa's elves acting as a sometimes mischievously disgruntled workforce, cracking jokes, making riddles, and pulling pranks on their boss. For instance, a Bloom County story from December 15, 1981 through December 24, 1981 has Santa rejecting the demands of PETCO (Professional Elves Toy-Making and Craft Organization) for higher wages, a hot tub in the locker room, and "short broads," with the elves then going on strike. Ronald Reagan steps in, fires all of Santa's helpers, and replaces them with out-of-work air traffic controllers (an obvious reference to the 1981 air traffic controllers' strike), resulting in a riot before Santa vindictively rehires them in humiliating new positions such as his reindeer. In an episode of The Sopranos titled "...To Save Us All from Satan's Power," Paulie Gualtieri says he "used to think Santa and Mrs. Claus were running a sweatshop over there... The original elves were ugly, traveled with Santa to throw bad kids a beatin', and gave the good ones toys." In Kyrgyzstan, a mountain peak was named after Santa, after a Swedish company had suggested the location be a more efficient starting place for present-delivering journeys all over the world, than Lapland. In the Kyrgyz capital Bishkek, a Santa Claus Festival was held on December 30, 2007, with government officials attending. 2008 was officially declared the Year of Santa Claus in the country. The events are seen as moves to boost tourism in Kyrgyzstan. The Guinness World Record for the largest gathering of Santa Clauses is held by Thrissur, Kerala, India where on December 27, 2014, 18,112 Santas came overtaking the current record of Derry City, Northern Ireland. 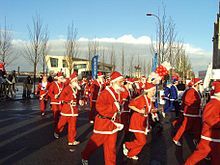 On September 9, 2007, where a total of 12,965 people dressed up as Santa or Santa's helpers which previously brought down the record of 3,921, which was set during the Santa Dash event in Liverpool City Center in 2005. A gathering of Santas in 2009 in Bucharest, Romania attempted to top the world record, but failed with only 3,939 Santas. ↑ "My son catching santa putting gifts under the tree". ↑ "Santa Claus". Encyclopædia Britannica. Retrieved 2010-12-25. ↑ "Santa 2010 website by Airservices Australia". Mirror.airservicesaustralia.com. Archived from the original on 20 December 2010. Retrieved 21 December 2010. ↑ "Safe Travels Santa! We will Be Watching, 19 Dec 2005". NASA's Canberra Deep Space Communications Complex. Archived from the original on 16 February 2011. Retrieved 4 December 2010. ↑ "Tracking Santa with Bing Maps, by Chris Pendleton, 24 Dec 2009". Microsoft. Archived from the original on 1 January 2010. Retrieved 5 December 2010. ↑ "DFW airport unveils Santa Tracker website, 18 Dec 2006". PegNews wire. Archived from the original on 26 August 2011. Retrieved 4 December 2010. ↑ "Frank and Debi DeFreitas of Holoworld". Frank and Debi DeFreitas. Archived from the original on 6 December 2010. Retrieved 4 December 2010. ↑ "Here Comes Santa Claus! Watch it on the Web!, 24 Dec 2005". WRAL.com – Raleigh, Durham, Fayetteville – North Carolina's TV Station website. Archived from the original on 8 August 2011. Retrieved 4 December 2010. ↑ Gurnon, Emily (23 December 2014). "How A Sears Typo Led To NORAD's Santa Tracker". Forbes (New York, United States: Forbes, Inc.). https://www.forbes.com/sites/nextavenue/2014/12/23/how-a-sears-typo-led-to-norads-santa-tracker/. Retrieved 24 December 2014. ↑ "emailSanta.com Press Kit". emailSanta.com. ↑ "You'd Better Not Pout! Booz Allen Supports NORAD to Track Santa's Approach This Year, December 1, 2010 by Booz Allen Hamilton". Booz Allen Hamilton. Archived from the original on 10 December 2010. Retrieved 1 December 2010. ↑ "It's Time for e-Sputnik, by Patrick Gorman, December 8, 2010". Government Executive. Retrieved 10 December 2010. This page was last changed on 28 February 2019, at 00:40.